Twenty years after the emergence of queer as a political concept, the contributions to this anthology discuss the radical potential of queer theory and activism within different spatial, cultural, and socio-political contexts. Both the term queer as well as initial concepts of queer critique are not only closely connected to the English language but also to the Anglo-American socio-political context. Nevertheless, queer has traveled a lot since its emergence in the 1990s. Therefore, this collection explores how and for what purposes the term queer is and has been appropriated within different settings and locations, such as academia, activism, and popular culture. 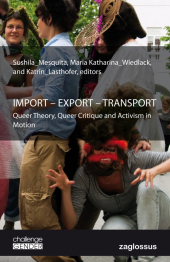 The volume opens up a space for trans-regional, intersectional, trans-disciplinary, and genre-transgressing exchanges about queer theory, queer critique, and queer activism.